Andre’s getting wed. For his last party as a bachelor, we drank beer, fished and camped on Tomales Bay. Friday night’s festivities in S.F. shall not be mentioned. Saturday, we ever so casually packed boats and headed to Nick’s Cove. It was somewhere near six p.m. when I stepped on my board for the paddle to camp. The beaches were remarkably crowded. I wonder how many people were there without permits. Or perhaps it’s that Blue Water’s commercial-use permit in addition to the individual permits made for the neighbors. Ernie made killer tacos. He’d brought a grill that sat on top of my Whisperlite. Beans were cooked at home. Salsa was super spicy. Nicely done Ernesto. Frying fish encrusted with gold fish crackers, toast and sour cream and onion pretzels. It was damn great to have a college reunion with just the guys. The bioluminescence was strong. It was incredibly neat to paddle around in the pitch dark with every disturbance of the water sparkling like the stars. Thankfully, we didn’t pack up on Sunday. The day was spent fishing and goofing around. We had no luck from Brent’s boat but we did catch and release a large bat ray from the beach. Warren’s boat left the bay and caught a half dozen or so rock fish (dinner) but had no luck with the salmon. We stayed up late. Finished the beer. Ate most of the food. Walked the beach. 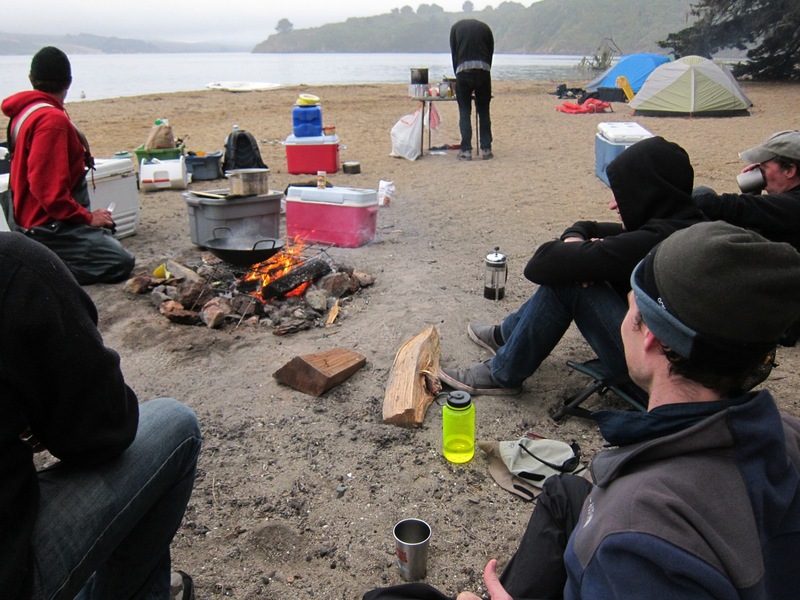 I’ve kayak camped on Tomales many times – usually leading college kids. This was far more fun.